A young boy longs for reassurance about how his mother died. To protect each other, he and his father keep their pain inside, where it festers. 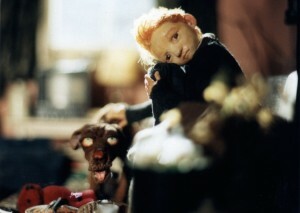 Suzie Templeton studied at the Surrey Institute of Art and Design University College, England, where she made the multiple award-winning animation "Stanley" (wbff 2001). She also worked on two Channel 4 films, the Oscar shortlisted "Silence" by Sylvie Bringas and "OrIy Yadin, and Andares in Time of War" by Alejandra Jimeflez. In 2001 she graduated with an MA from the Royal College of Art in London where she made the sand animation and live-action "Inside" and the puppet animation "Dog". Her animation "Peter & the Wolf" won an Academy Award in 2008.